Mattel has created many popular Barbie lines that stand the test of time, including this collection that we love: the Birthstone Barbies. 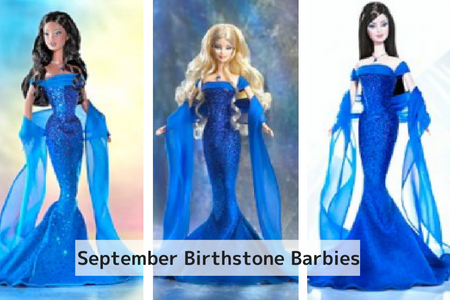 There are more than one lines of Birthstone Barbies but the first was released in 2002. The dolls have become a popular collector’s item. Some people are collectors who want to buy the entire collection because they love Barbie. 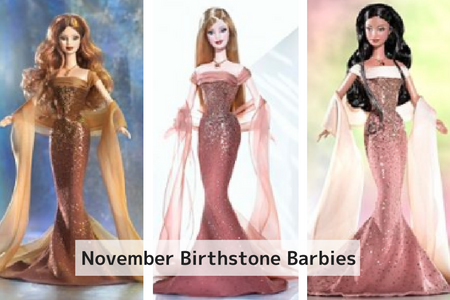 Others just want the Barbie that represents their birthstone or buy them for a child to match their birth month. 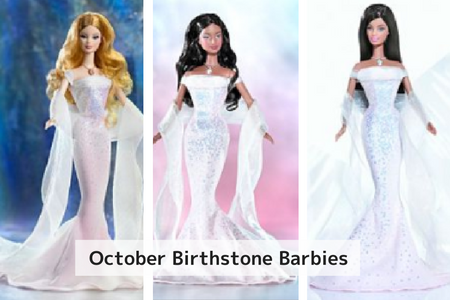 Here are the 2003 Birthstone Barbies on Mattel’s site. Each doll is dressed in a floor length gown with gloves (you cannot see their shoes). The dress matches the color of the doll’s assigned birthstone. 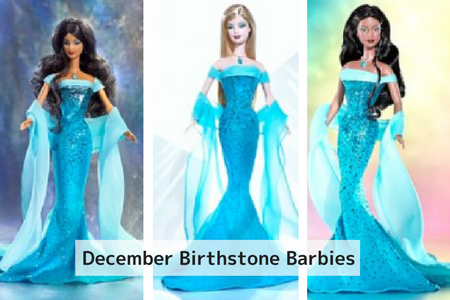 There are 36 versions of Birthstone Barbies. Each month has 3 Barbies per birth month. They all look similar but with a different skin tone. They are wearing long gowns with a wrap. Each is wearing a birthstone necklace with their respective birthstone. 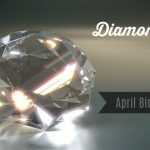 Next came the Birthstone Beauties in 2007 – see them here. These Barbies have a more contemporary look with shorter dresses and they all go by the name of Miss. 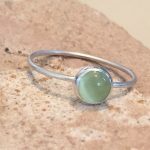 Instead of just a birthstone necklace, they have a birthstone bracelet too! Each comes with a small puppy on a leash. The puppy’s leash and crown match and are in the same birthstone shade. Accompanied by a miniature dog! 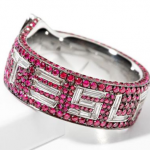 Where are some Places to Buy Birthstone Barbie Dolls? While Mattel still lists Birthstone Barbies, they no longer sell them. 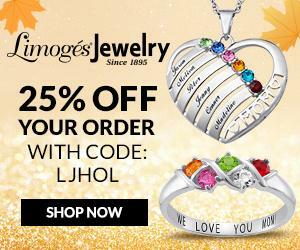 How Much Do Birthstone Barbies Cost? Barbie dolls named after birthstones, dressed in coordinating fancy attire, are going for a variety of prices. Some eBay auctions start out as low as around $10, while others start as high as $250. 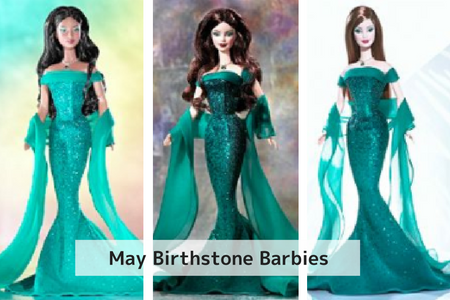 All Birthstone Barbie dolls wear an outfit that is representative of the birthstone they are named after. 2002 and 2003 Barbie dolls of this line have a more formal appearance, while 2007, the dolls are more casual and come with a dog. 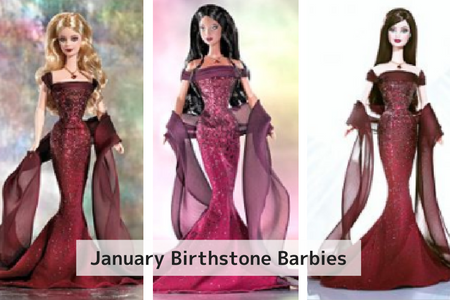 The 2007 Barbie Pink Label Birthstone Beauties Collection consists of dresses that fall at the knee and the overall design has transitioned to a slightly less formal feel. Note: The descriptions below are representative of the 2003 line. Representative of the birthstone Garnet, this Barbie doll is dressed in a deep red, chiffon evening dress. With a hint of sparkle and sophisticated wrap, she exudes class and style. Of course she’s wearing a garnet necklace and bracelet too. 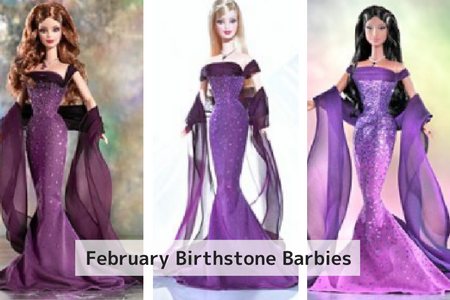 Pretty in purple, this Barbie’s dress reflects the rich tone of the amethyst stone. Dazzling in glitter, from head to toe, this Barbie is dressed in a beautiful ensemble. 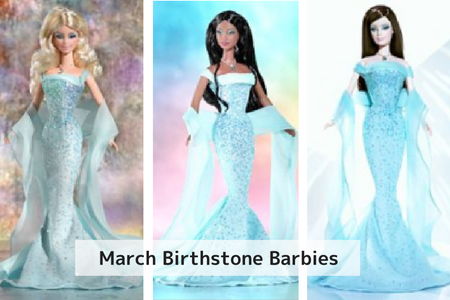 The Aquamarine Barbie is dressed in a gorgeous, pastel colored aqua dress, inspired by March’s birthstone, aquamarine. Similar to the others, she has added sparkle to really make the dress shine. This Barbie is clothed in an elegant white gown, that proves to be a perfect canvas to showcase the glitter in her dress. This color choice accompanied with sparkle is definitely reminiscent of the coveted sparkling diamond. 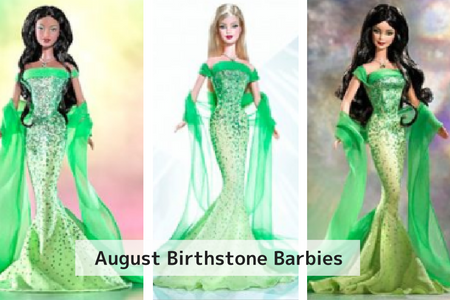 The Emerald Barbie has a similar dress design as the other Birthstone Barbies, but the rich, forest green color proves to be a very striking choice. 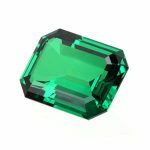 It is definitely an accurate portrayal of the bold emerald stone. Although the color scheme for the Pearl Barbie has similarities to the Diamond Barbie’s attire, it is definitely different. A softer look is portrayed with a more cream undertone complimented with of course sparkle. The classiness of the cream evening dress definitely portrays the classiness associated with the delicate pearl. 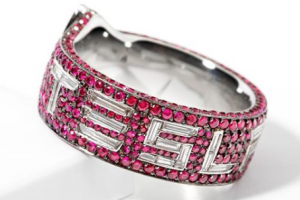 Bold and beautiful are two words that come to mind when you see the Ruby Barbie. Her beautiful uniquely colored red hair accompanied with her rich in color red dress, is definitely a combination that cannot be ignored. 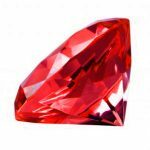 This sparkly red evening wear is a great take on the Ruby stone. The two different shades of green chosen for this dress bring a fun flare to a classic evening gown. This dress promotes the unique beauty of the peridot birthstone. A rich deep blue reflects the classy upscale feel of the sapphire. This color choice works well with the dress design. The iridescent color of the opal is represented nicely in this Barbie’s gorgeous evening gown. White with subtle shades of pink and blue inter dispersed throughout the dress really make this evening gowns color pop. The topaz stone is creatively represented in this Barbie’s dress with a mauve tone accompanied with gold clusters of glitter. 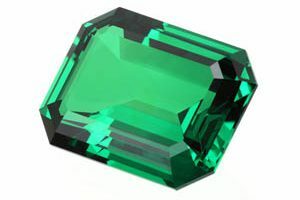 It is very pretty and unique, just like the topaz birthstone. This Barbie’s fun blue turquoise gown, accompanied by fun, bunches of blue glitter, is beautiful. 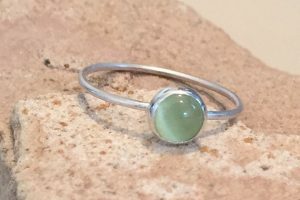 The two tones capture the essence of the turquoise birthstone. 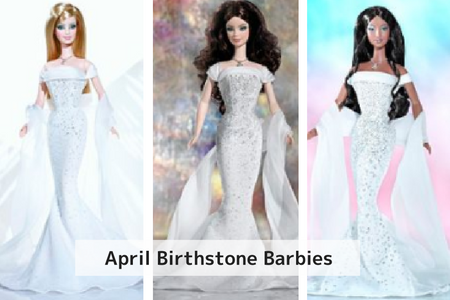 The Birthstone Barbie doll collection is a popular Barbie doll line, especially for birthstone enthusiasts. With fabulous dresses that reflect the beauty of each birthstone, and birthstone necklaces they wear, it’s no wonder these Barbie dolls are a collector’s item.